So, please, I BEG YOU, use an alternative… bronzer, mystic tan (although I despise the orange hue), buildable color moisturizer, or tinted moisturizer. 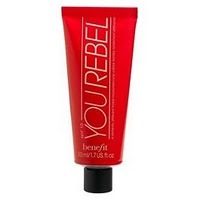 Benefit’s You Rebel gives good summer face. It’s a tinted moisturizer with SPF 15 and it adds just the right amount of gold (without looking super fake) to your skin. **TIP** Try mixing it with a touch of foundation for an even, flawless, bronzed complexion with added coverage! 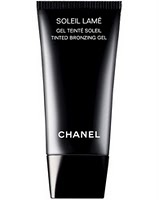 Chanel’s Soleil Lame Tinted Bronzing Gel is lightweight and basic. It’s a gel (which I love… doesn’t cake) that glides onto the skin to produce an even tan sans the sun. The color is natural and the gel absorbs without the shine of tinted moisturizers. Great for oily complexions! Tarte Hotel Heiress is a long time favorite. It’s a powder bronzer (mineral) and I swear, it gives off the best damn sun-kissed effect. I’ve tried many a bronzers and this one continues to be an everyday must-have. It doesn’t give off that sparkle, fake tan look… this bronzer is way more matte and truly au natural. Glow Fusion is another favorite from last year. It’s the closest thing to a mystic tan (that I’ve found) AND you can do it yourself… at home! BONUS: It doesn’t give you that nasty, orange spray-tan look! The color is actually amazingly bronze! And if you follow the directions, it really does give you even, precise color. 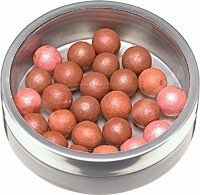 Physicians Formula Pearls of Perfection Multi-Colored Bronzer is fantastic for those porcelain skinned folks out there. It has a pink undertone to offset the gold so it doesn’t appear too fake (instead it gives off a “warm” finish). I love the consistency – it’s soft and smooth – and it really leaves skin glowing. The pearls are also incredibly fun to play around with… it’s like a combination of loose powder (very potent) and pressed powder (matte, and not as messy). And you can’t beat the price: $11.95. 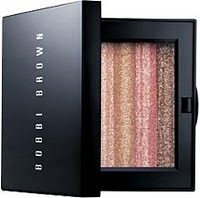 Bobbi Brown Bronze Shimmer Brick Compact is shimmery and glittery and full of iridescent fun! Personally, I don’t like loads of shimmer in my bronzer, but for those of you who do, this is the bronzer to get. It has five shades, all ranging in golden hues, and it mixes together quite brilliantly to produce a healthy, vibrant, glowing face. 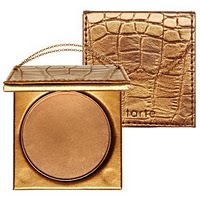 I do, however, love this product as an added highlighter atop my matte bronzing powder. It really does create a gorgeous, golden dimension to the skin.